YourHR.space is an up-to-date and fully compliant online employee handbook offering the ultimate risk management solution, breaking down barriers between employees and employers, for a transparent, open working environment. We’ve seen first-hand what happens to companies who fail to provide their employees with legally compliant and accessible employee handbooks that set out well-communicated expectations and procedures in the workplace. With our team of HR professionals, we’ll work with you to ensure all standards, policies and other documentation remains in line with changes to employment law, case law and new policies, notifying employees as soon as these come into effect. With YourHR.space, you’ll be avoiding unclear employee-employer claims and disputes by making everyone aware of their legal and personal responsibilities at work. As an employer, complying with employment law and following correct procedure in the workplace is key to the smooth running of a business, helping to avoid employment tribunal claims and improve employee relations. 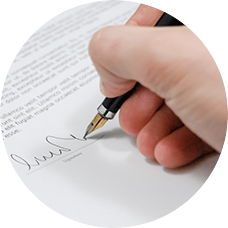 Keeping policy documents and company information up-to-date protects both employees and employers from a breach of contract claim. With YourHR.space, you’ll be providing clarity to employees and maintaining compliance with the law while still remaining flexible to changing circumstances. What’s included in an employee handbook? 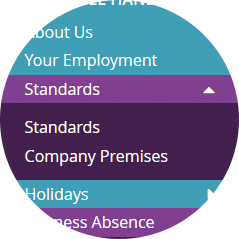 We create bespoke employee handbooks to suit the needs and demands of your business. Your online handbook will be able to host a range of accessible functions and documents, which are continuously updated by our expert HR team. We ensure your handbook remains completely compliant with the most recent legislation so you don’t have to. 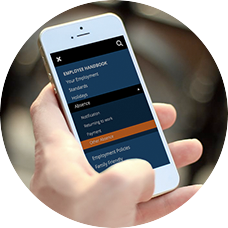 A fully managed cloud based employee handbook that makes your HR documentation accessible 24/7. Services for any business with a workplace issue or problem. We will make HR easier for you. New data protection legislation (GDRP) with implications on HR/employee records plus general policy regarding data management: Required updates/changes to YourHR.space will start from January 2018, including new policy documents, changes to contracts of employment regarding consent, introduction of online consent facility. Taxation on termination payments takes effect. Tax Free Childcare scheme: Full implementation of tax free childcare scheme. Current childcare voucher schemes will be closed to new applicants. 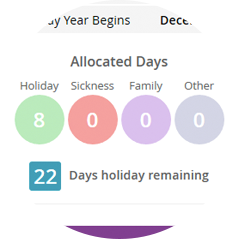 Calculation of holiday to include voluntary overtime (following case law decision). General communication to all employees regarding equal opportunities. A day's pay - confirmation of how a day's pay is calculated (following case law decision). Zero Hours employees – right not to be unfairly dismissed or to suffer detriment as a result of failing to comply with exclusivity clauses. Modern slavery statements – from 1st October employers with an annual turnover of £36 million per year or more will have to publish a modern slavery statement each year. Travelling time is working time – Following case law decision, certain commuting constitutes “working time”. Shared Parental Leave – introduced enabling eligible employees to share maternity or adoption leave. Changes to Adoption Leave – became a ‘day one’ right, so employee will no longer need to have 26 weeks’ continuous employment to be eligible. Also Statutory Adoption Pay to be brought in line with maternity pay. Changes to Parental Leave - leave can now be taken at any time before a child’s 18th birthday. Fit for Work - the government launches its new health and work assessment and advisory service. The service will offer free occupational health assistance for employees, employers and GPs either online or via the telephone. Changes to disciplinary & grievance procedures – following revised ACAS Code on Disciplinary and Grievance Procedures regarding making a request to be accompanied at disciplinary & grievance hearings. Changes to Travel and Alcohol & Drugs Policy – following change in legislation to made it illegal to drive when over certain limits for certain drugs. What does a managed service mean? A managed service means that we manage and maintain the HR site on your behalf. This includes everything from hosting the site to updating the HR content (e.g. when there are changes in legislation), to recommending (and drafting) new HR policies which may be needed as a result of changes in legislation, case law or social trends. We also manage the communication by sending out emails and announcements to employees so that they are kept informed of any changes. Your site is always compliant and up to date, with minimum input from you. Will the software be branded? Yes. YourHR.space will have your logo and colour scheme. The site and its content is bespoke to your company. How will you update us about legislation changes? When there is a change in legislation we will inform those who look after HR in your organisation first (and in advance of any changes). We will then update YourHR.space on the day of the change and send out a communication to all employees. 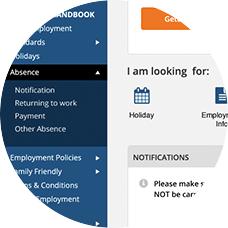 There is also a section on the site that summarises recent changes for employees. Some updates are only relevant for those who look after HR and in this event our communication is to HR users only. I’ve already got a handbook ...why do I also need an online one? The problem with a written handbook is that it gets out of date very quickly as employment law changes. If you update your written handbook regularly then you have to send out updates to employees or re-issue the handbook. This can be costly and time consuming. It also means there is a delay between legislation changing and up-to-date information being communicated. You can also find you have several 'versions' which can cause confusion. YourHR.space takes away these problems. We update it and communicate changes in a timely fashion and the latest version is always on the YourHR.space. There is also an easy to follow navigation and a search function that makes finding what you want really easy. How do I control who sees what content on the site? There are different access levels to YourHR.space: Employee, Manager and HR. You decide who has access to which areas. You can change this whenever you want. You can manage the users you have on YourHR.space. When you have a new starter you can add them to the site and when you have a leaver you can archive them (remove them). There is also a new starter checklists and a template induction booklet to help make on-boarding and induction even easier and more effective. For leavers, there is a check list and an on-line exit interview form you can ask people to complete. Additional content can be added. For example you may want to put your Health and Safety policy and risk assessments on the site. Your Account Manager will add any content for you. They will also recommend how best to display the content e.g. you could add a .pdf document that can be opened by employees or your Account Manager can set up new pages with images and links. While we can load additional, non HR, documents, you will remain responsible for this content. Keeping up to date, drafting and updating documents and communicating this is a very time consuming job. It also requires some specific experience and knowledge of employment law. The time YourHR.space would save your HR person would allow them to spend more time on other areas of HR. Think our HR managed website could be right for you? © 2002-2017 Practical HR Ltd. All rights reserved. Registered No 4430009.